Walt Fleming has been a tinsmith for over 30 years working in his mid-1840's tin shop. His specialty is rare early lighting, pierced lanterns, closet safe panels, whale oil, candle and folk art. Most of his work is done with 100+ year old tinplate and replacing missing/broken parts on early tinware/lighting pieces so it is very difficult to detect the repairs. Walt Fleming is extremely proud of his service in the United States Marine Corps. Walt Fleming is from Ballston Lake, New York. Susan Daul uses pen, ink and watercolor on parchment paper to create Fraktur, including House Blessings, Marriage Blessings and Birth Blessings. Her butterflies are a combination of acrylic and water colors on rice paper. After the paintings are completed, Susan Daul cuts out each butterfly and frays the edges to produce a more realistic appearance. 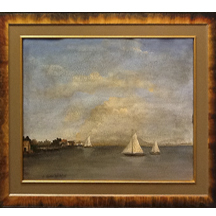 Her paintings are framed in hand grained frames or antique frames. 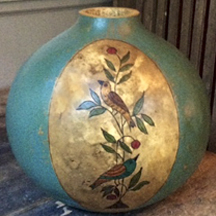 Susan Daul is from Matthews, Massachusetts and is included in Early American Life Magazine’s Traditional American Crafts Directory Listing of artists. This is Susan’s first year participating in the American Craftsmen Show. She is a member of the Early American Folk Art & Trades Facebook group. In the Connecticut workshop of Shaari Horowitz, traditional craft is reinterpreted and transformed into a contemporary art form. Intricate hand-painted patterns derived from old-world color palettes surround the gilded and glazed surfaces of our hand-hewn & turned wood bowls. Each piece carries an original design based on classical sources with roots in medieval manuscripts, ancient textiles and the frescoes of Pompeii. These bowls serve as both functional and decorative works of art. This is Shaari’s first year participating in American Craftsmen Show. Shaari Horowitz is from Sharon, Connecticut. She is a member of the Early American Folk Arts & Trades Facebook group. 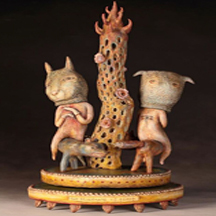 Steve Earp is inspired by the clarity and beauty of traditional ceramic art from the 17th to 19th centuries. 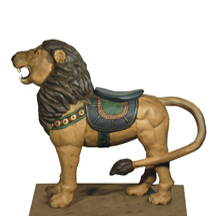 His intention is not to make exact copies of original artifacts, but to interpret, promote, and enjoy the formal and decorative possibilities of these fascinating historical styles. Stephen Earp is from Shelburne, Massachusetts and is included in Early American Life Magazine’s Traditional American Crafts Directory Listing of artists. He is also a member of the Early American Folk Arts & Trades Facebook group. 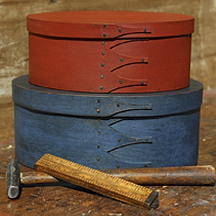 Rob LeHay creates boxes and carriers in the Shaker tradition using lumber milled on site. His materials are either produced on his property or come from small, American businesses. The boxes and carriers are finished using all natural products including milk paint, dyes, oils and waxes. The boxes are fastened with copper tacks which have been produced on original tack-making machines from the 1880s. The tacks are then darkened to provide an aged finish. Every part of the box is completed individually by his own hands. 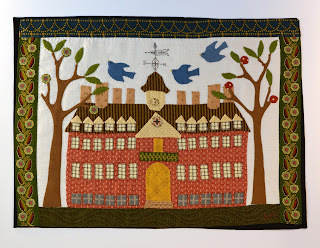 Pam Dalton creates original designs (Scherenschnitte) influenced by popular historical themes such as patriotism, biblical and religious motifs and scenes from rural life. Each piece is sketched freehand and then cut by hand, from a single piece of paper. The finished piece is placed in a false grain frame. Wouldn't you want to win one of these lovely American Craftsmen Show door prizes (see below): redware by artisans Greg and Mary Shooner or a whimsical fiber art design by artisan Jeannine Happe. To be eligible to win a door prize you must add your name to the mailing list when you attend the American Craftsmen Show on November 7th. 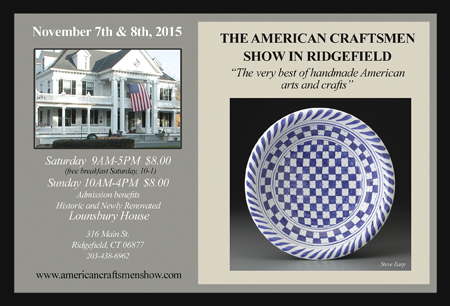 The American Craftsmen Show is at located at the Ridgefield Community Center at Lounsbury House. See you soon! Larry Koosed, along with his wife Paige, has been carving for 40 years. Starting by reproducing early American folk carvings, Larry Koosed has transitioned into creating only originals, based on those traditional designs. All his work is completely hand carved and painted. 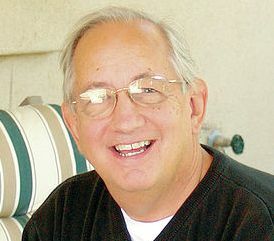 Larry Koosed is from Perrysburg, Ohio is included in Early American Life Magazine’s Traditional American Crafts Directory Listing of artists. Paige Koosed has been painting and woodcarving for 40 years. With her technique of putting color and then muting it, she captures a depth and texture that is reminiscent of older paintings. 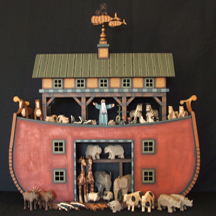 Mo and Kelly Dallas translate their love for Noah's Arks into works of art. From classic to whimsical, each one is a true original. Their attention to detail and wide range of designs make the Dallas' Arks appealing to everyone. 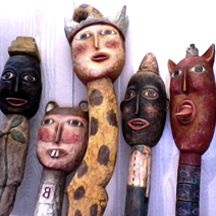 Kelly Dallas is a member of the Early American Folk Arts & Trades Facebook group. Wouldn't You Want One of These Six American Craftsmen Show Artisan Door Prizes! New Sandy Malamed Door Prize! 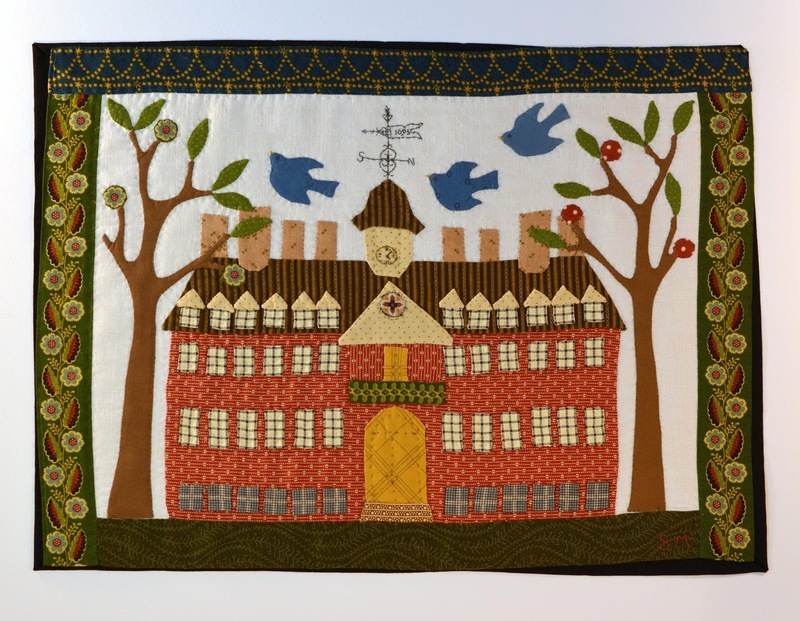 Can you guess which William and Mary College building is portrayed in this applique quilt by American Craftsmen Show artisan Sandy Malamed? If not, you will have to ask her when you come to the American Craftsmen Show on November 7th at the Ridgefield Community Center at Lounsbury House. You will have a chance to win this beauty as a door prize if you sign up on the American Craftsmen Show mailing list. See you there! You Might Want To Take A Look At Some Of The American Craftsmen Show Door Prizes! 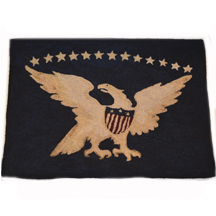 Floorcloths are a part of our American heritage. George Washington, John Adams, and Thomas Jefferson had them. The floorcloth designs of Michele Hollick are based on floors that were stenciled in New England and New York. 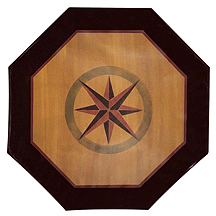 Early floorcloth patterns are geometrics (like a diamond) or nautical themes like a mariners compass. Some of her designs also come from Moses Eaton’s wall stencils. Every step of a floorcloth is done by hand, in our backyard barn, and no two are exactly alike. Michele Hollick is from Hollis, New Hampshire. She is a member of the Early American Folk Arts & Trades Facebook group. Interested In Winning An American Craftsmen Show Door Prize? Don't forget to join the American Craftsmen Show mailing list when you attend come to show on November 7th and 8th. Seventeen American Craftsmen Show artisans have donated original works of art that will be given away as door prizes throughout the Show to Show attendees that have been added to this mailing list. Marlene Coble is a traditional painter. Her work consists of painting on furniture and accessories as well as painting on paper and canvas. She considers the dimensional forms the “canvas” for her creative expressions. Marlene Coble works in oil, watercolor and acrylic. Her subjects are broad, ranging from birds, animals and flowers to whimsical circus themes. Marlene Coble is from Wabash, Indiana. She is a member of the Early American Folk Art & Trades Facebook group. Leonard Marschark handcrafts tall case clocks of uncompromising quality. 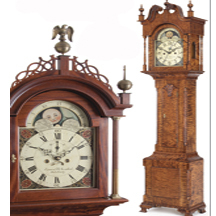 Finely figured woods and traditional joinery are the hallmark of these accurately recreated clocks with the magnificent look of 18th century originals. A custom painted dial and expertly crafted brass movement completes each masterpiece. Made one at a time, each heirloom treasure is numbered and signed with only a limited number created each year. Leonard Marschark is from Bedminster, Pennsylvania and is included in Early American Life Magazine’s Traditional American Crafts Directory Listing of artists. 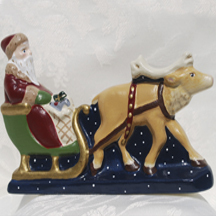 Kathleen McDonald has been creating chalkware Santa's and other Holiday figurines for more than ten years. Each piece is individually hand-cast using one of Kathy's antique chocolate molds. Once released from the molds, the figurines are then hand-painted and detailed. Some pieces are trimmed with embellishments such as goose feather sprigs (which represent Christmas trees) or German glass glitter, vintage tinsel, antique lace and vintage millinery flowers. 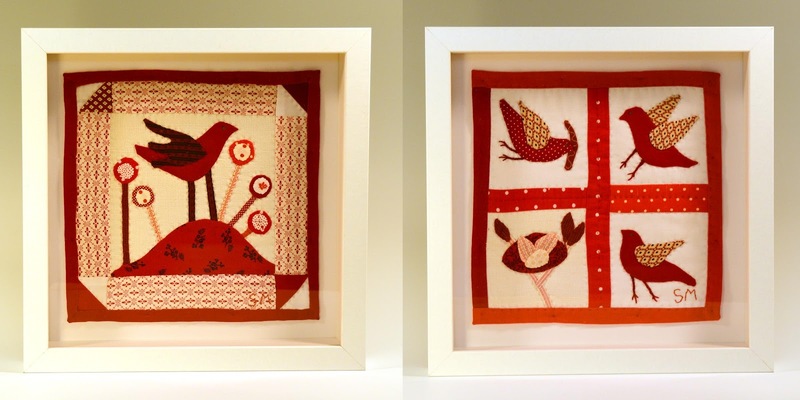 Karen Worthington is a self-taught fiber artist residing in Warren County, New Jersey. She hand-dyes wool for both her hooked rugs as well as her felted animals. 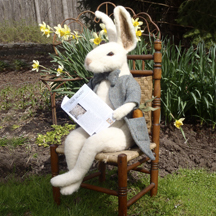 Karen creates one-of-a-kind designs both in her hand-hooked rugs and her needle-felted animals. Karen Worthington is from Harmony, New Jersey and is included in Early American Life Magazine’s Traditional American Crafts Directory Listing of artists. She is a member of the Early American Folk Arts & Trades Facebook group. Karen Hill is an American designer who has created one-of-a-kind and limited edition pieces of jewelry since 1987. In late 1989, she began to explore lampworked glass bead making. Karen Hill was attracted to using glass in her designs because of its beauty and the enduring quality of the material. Karen’s interest in the antiquities sparked her desire to make glass beads. 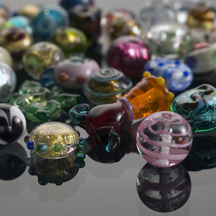 As luck would have it, Karen’s husband Jim Hill, who is a geochemist, was able to experiment and helped Karen Hill to rediscover the ancient techniques of glass bead making, with a few unique twists of his own. Linda Hill is from Riderwood, Maryland. Jeannine Happe is a fiber artist working primarily with wool. Jeannine designs and hand hooks all her rugs, sometimes using her own adaptation of an antique design. Designs vary from traditional primitive designs to finer cut designs. She uses a variety of wools, very often hand dyed, to achieve precisely the right shade she has envisioned for the piece. 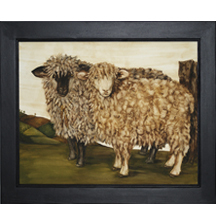 Jeannine Happe also hand sculpts little animals from raw sheep or alpaca wools. Jeannine Happe is from Blairstown, New Jersey. She is a member of the Early American Folk Art & Trades Facebook group. For over 3 decades, the redware pottery of Greg Shooner and his wife Mary Shooner, has found a place in private collections and museum shops all across America and abroad. 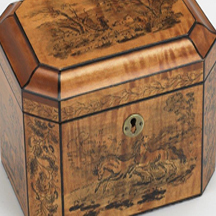 Featured in magazines and newspapers, this ware remains unrivaled in its interpretations of rare antiques. 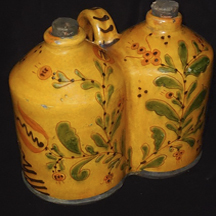 Using exact early techniques, the Shooner's slipware decorations include the full range of sgraffito, "fancy" slip, and quilling on drape-molded plates and platters, as well as a full range of unique wheel-thrown jars, crocks, jugs, and lamps. Greg and Mary Shooner and from Oregonia, Ohio and are included in Early American Life Magazine’s Traditional American Crafts Directory Listing of artists. 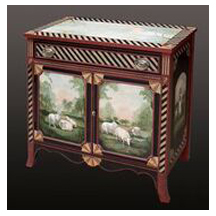 Eve Marschark specializes in Women’s Painted Furniture, an early decorative art form of American Schoolgirl Art, practiced in academies from 1790 to 1830 by young ladies of means along the east coast. Pieces were painted on finely figured and designed wooden boxes and tables with images that reflected personal experiences. 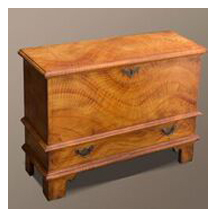 Eve Marschark offers pieces of finely figured curly maple, birds-eye maple and other light woods. Each piece is designed one-at-a-time with attention to detail and historic relevance so that you may have your own heirloom to pass down through generations, commemorate marriages, births, and celebrate your family. Starting every Thursday from September 10th through November 5th you can follow your favorite American Craftsmen Show artists on the Facebook Group Early Folk Arts & Trades as they share their preparations for the upcoming show on November 7th and 8th. The Early American Folk Arts & Trades Facebook group is the Facebook community for the traditional and early American crafts world. Not an Early American Folk Arts & Trades Facebook group member? Click on the Early American Folk Arts & Trades logo on the sidebar of this blog to join the action. 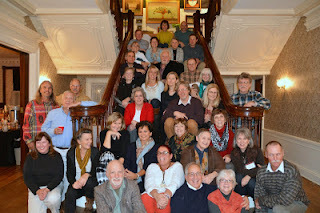 Don't miss out on meeting and discussing the American Craftsmen Show with the artists. D. Masters Kriebel has been painting in the traditional folk art style for over forty years. Her work is done in acrylic paint on gessoed board with a cracked and polished finish. 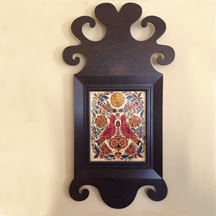 The frames are hand painted in the old grained style. The subject matter includes landscapes, still life's of fruit and flowers and animal portraiture. D. Masters Kriebel is from Earlyville, Virginia is included in Early American Life Magazine’s Traditional American Crafts Directory Listing of artists. Diane Louise Paul is a self-taught leather Artisan. A state-juried member of the League of New Hampshire Craftsmen, she has met the League's high craft making standards. Her mastery of the craft, heritage techniques, and workmanship has earned her a spot 11 years in a row as one of the top craftsmen doing pre-Civil War heritage "museum quality" work, as judged by Early American Life Magazine's panel of experts. Diane's interest in making leather crafts evolved from her love of horses and antiques. Diane Louise Paul is from North Hampton, New Hampshire and is listed in Early American Life Magazine’s Traditional American Crafts Directory Listing of artists. She is a member of the Early American Folk Arts & Facebook group. Catch this YouTube video where Rick and Denise Pratt demonstrate how they create their beautiful willow twig mirrors! 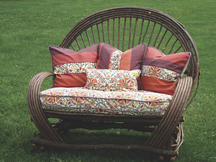 Rick and Denise Pratt use a traditional and contemporary blend of willow furnishings for your home and garden. They incorporate hand-chosen fabrics and individually mixed paints for a unique and functional piece of art. Rick and Denise Pratt are from Wooster, Ohio. 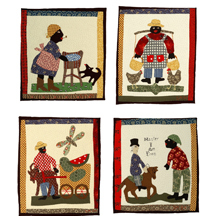 Denise Pratt is a member of the Early American Folk Arts & Trades Facebook group. These Artists Collaborate on Pinterest. Follow All the Action! One of the many special things about the American Craftsmen Show is its artist's investment in making it the best show for traditional and handmade arts and crafts. The American Craftsmen Show artists are also one social media savvy group. The Show artists have created a collaborative Pinterest board where they collectively pin images of their work. What teamwork! If you want to learn more about the American Craftsmen Show artists and their work, don't forget to follow their Pinterest Board. 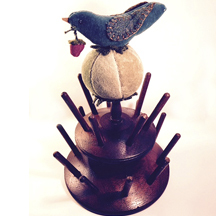 The work of Deborah Hartwick is whimsically designed, sewn art pincushions and emerys using the same blend of color and texture that evoke the antique sewing pieces of the past. Her artwork is made using natural fabrics like cotton and wool and then a dyeing and over dyeing technique, finally and stuffed with sawdust and emery powder. 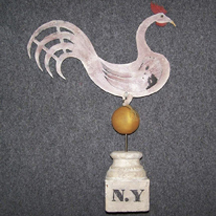 Deborah Hartwick is a member of the Early American Folk Arts & Trades Facebook group. Self-taught, Virginia artist Donnie Rogers has been wood carving for about 25 years. He and his wife, Deborah, design unique one of a kind rattles, scenes and small figures everyone has come to know and love as the "Little People." Donnie hand carves using only a hatchet, a hand drill, rasps, xacto knives and various carving blades. His woodcarvings are at once primitive yet sophisticated. Each piece of Deborah Roger's work begins as a drawing/blueprint as her unfired clay warps and shrinks. Altered and fabricated objects are made in advance, incorporating them as the clay is hand built. Washes of acrylic, layers of colored pencil, dyes, ink, drawings and commentary are added to the surface. The narrative story, as important as the 3-D piece, marry to convey a message as a whole. Surfaces are preserved with paste wax. Deborah considers herself an Intuitive Visual Artist/Sculptor. In her words, "the eyes will see strange things that the mind will alter. Deborah Rogers is a member of the Early American Folk Arts & Trades Facebook group. Did You Miss Your Favorite American Craftsmen Show Artists on Facebook? Visit Them On Instagram! Don't worry if you missed the art of your favorite American Craftsmen Show artist on the Show's Facebook page. 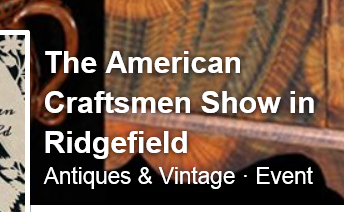 Many of the photos from this blog and the American Craftsmen Show in Ridgefield Facebook page will become available on Instagram! Don't forget to visit to "Like" and comment on your favorite images! Dan Coble is a traditionally inspired painter. His interpretations of Pennsylvania German designs, New England grain painting and other early American decorated furniture, frames and accessories, reflect his love for the history and art of the 18th and 19th century. Dan Coble is from Wabash, Indiana and is included in Early American Life Magazine's Traditional American Crafts Directory Listing of artists. He is a member of the Early American Folk Arts & Trades Facebook group. The oldest form of pottery is that made from gourds. Tom and Carole Bognar have given a new look to this age old type of pottery by creating many different styles of functional and decorative gourd items. Pitchers, canisters, vases and a variety of baskets and bowls. In creating their work Tom and Carole Bognar use various types of mediums such as watercolor, carving, wood burning, paint, dyes, pen and ink. As every gourd is unique, each piece of gourd pottery is one of a kind. 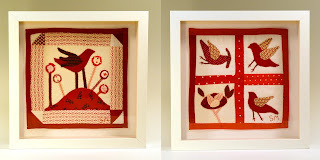 Barbara Dull is a self-taught weaver with over thirty years of experience. She works with luscious colors of hand dyed yarns and touchable textures of handspun fibers. Her designs are threaded onto a floor loom, where she weaves and finishes each original piece by hand. 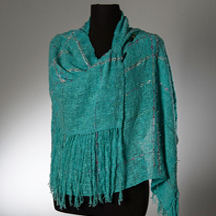 These one-of-a-kind and limited editions include shawls, scarves, ruanas and throws. 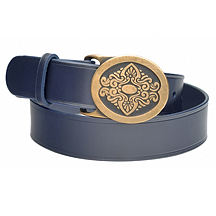 Each piece is elegant in design, easy to care for and sensuous to wear. Breakfast Is Served at the American Craftsmen Show! Isn’t it nicer to meet and chat with America’s top traditional and handmade artists over breakfast and a cup of coffee or tea? 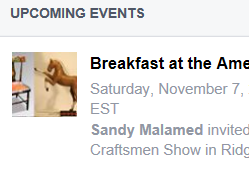 You can do this because the American Craftsmen Show will be serving breakfast from 10am to 1pm on Saturday, November 7th. To make this even “sweeter”, breakfast is free with admission! 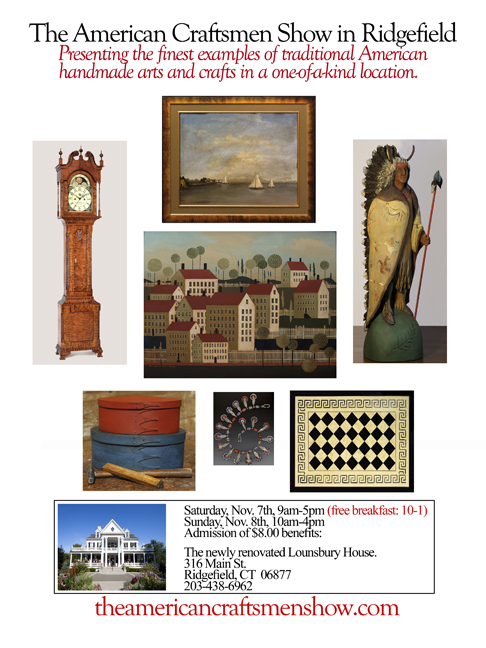 Breakfast is provided by the Lounsbury House, home of the American Craftsmen Show. On Facebook? 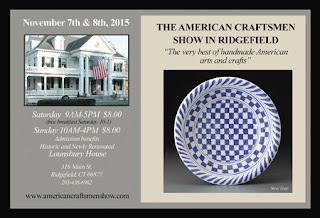 Don’t Forget to Visit the American Craftsmen Show In Ridgefield Facebook Page. 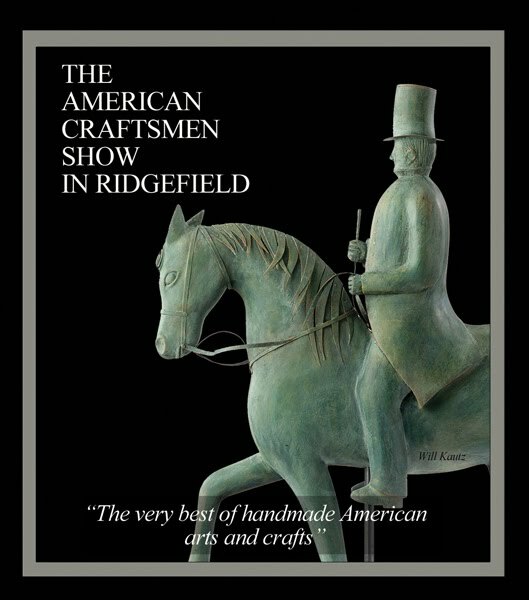 As you receive up-to-date information about the American Craftsmen Show and its artists on the American Craftsmen Show blog, please remember to also visit the American Craftsmen Show in Ridgefield Facebook page. Trivia Question: What Do 12 American Craftsmen Show Artists Have in Common? 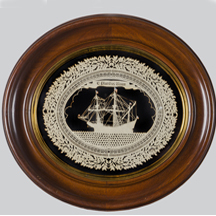 Early American Life Magazine's Directory of Traditional American Crafts is the showcase of artisans working in traditional techniques, materials, and style who have been selected as the best in America by a jury of museum curators, scholars, and other experts. The Directory of Traditional American Crafts is an honor bestowed on a handful of artisans who work in traditional media, styles, and crafts. In addition the Directory is also a buying guide. It presents a selection of the best historically informed handwork in America today. 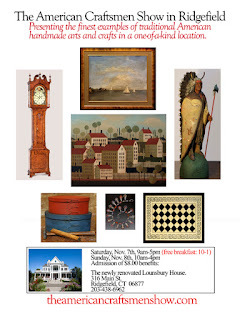 The Directory helps collectors select the best furniture, pottery, ironwork, decorative objects, and more for period-correct decorating, collecting, or movie-making. American Craftsmen Show is Social Media Savvy! The American Craftsmen Show is happy to announce its new social media campaign to get out the word about the 2015 show. There will now be many ways for folk art lovers of the finest handmade arts and crafts to find out more about the American Craftsmen Show and connect and develop relationships with its artists. The americancraftsmenshow.com blog has all of the latest information about the American Craftsmen Show and allows you to meet the artists through regular posts. The American Craftsmen Show in Ridgefield Facebook Fan Page allows you to post messages about the Show, see Show updates and posts made by the artists. 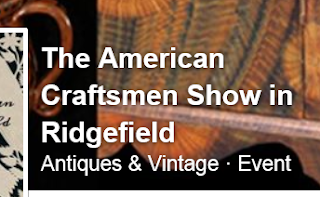 Please remember to “Like” the American Craftsmen Show in Ridgefield Facebook Fan page, as well as invite your followers to “like” it so that you and your followers can receive an invitation to attend the American Craftsmen Show. American Craftsmen Show artist Greg Shooner was featured for the cover story for the April 2015 issue of Early American Life Magazine. 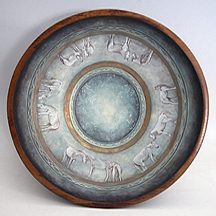 Both Greg and Mary Spellmire-Shooner were listed by Early American Life Magazine in 2014 for their American Redware. In “Slab-Formed Redware” Greg stated in this article “Many 19th-Century potters supplemented the work turned on their wheels with earthenware made by molds. 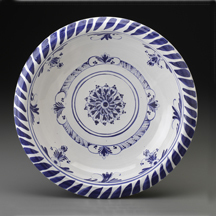 We have all seen redware dishes and their familiar “wavy line” decoration. Learning how these were – and are still – being made will help you understand both antique and modern molded redware pottery. Greg explains both the history, techniques and process used to create redware, as well as the use of slip to decorate redware and the techniques to create sgraffito. Traditional Painter Dan Coble in the News! The following press release appeared in KPC Media Group Inc. publications on August 11, 2015 regarding noted traditional painter and American Craftsmen Show artist Dan Coble. 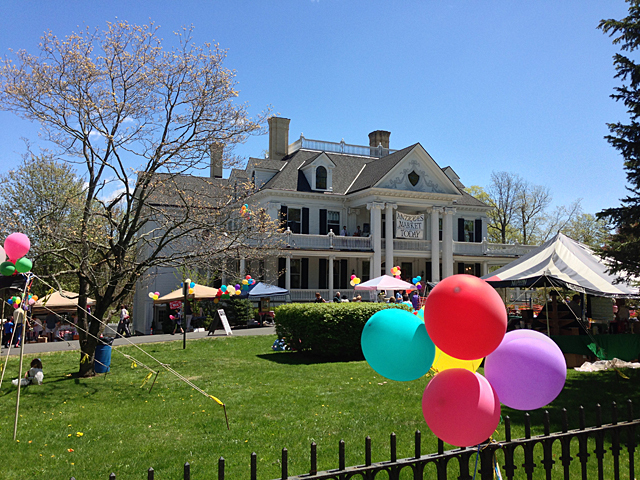 The American Craftsmen Show is returning to the stunning Lounsbury House in historic Ridgefield, CT for a second year. When I attended last year’s show I could not help but notice how the house’s beauty was such a complimentary setting for the beautiful artwork on display instead of the institutional settings of many other art shows. 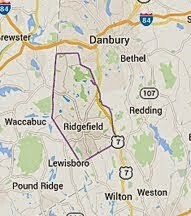 Ridgefield was first settled by English colonists from Norwalk and Milford in 1708, when a group of settlers purchased land from Chief Catoonah (also known as Chief Katonah) of the Ramapo tribe. Who Is Your Favorite 2015 American Craftsmen Show Artisan? I wish I could tell you mine, but there are too many wonderful artists to choose from. If you love fine traditional and handmade arts and crafts, it will be tough to decide who you will want to talk to first. The American Craftsmen Show is the perfect place to meet and develop relationships with the finest traditional and handmade artists and craftsmen today.